TT #77 Should I leave my Inverter On? Should I leave my Inverter on? I am frequently asked this question and typically I respond with a few probative questions before trying to provide an answer. Before delving into the answer, let’s look at Inverters and what they do. An inverter takes 12 Volt DC power from coach batteries and inverts it to provide 120 Volt AC power to allow TV’s, microwaves, electric refrigerators and so on so that these appliances and equipment will operate without the need for a 120 volt power cord connection or a generator running to supply AC power. Inverters have greatly improved over the last few years however the principle of operation has not changed. They do not "make” electricity, only "refashion” it from the battery power source. For every amp of power required at 120V they draw about 12 amps from the 12V batteries. About 90 percent of the power consumed is turned into usable energy. There is some power loss in the inversion process. There are two broad categories of Inverters: smaller (typically 300 to 1000 watt) units that supply power on many RV’s for the TV and entertainment systems, and larger (2000 to 3500 watt) units capable of supplying power for most AC appliances. Most smaller units do not provide any battery charging function. Battery charging on RVs equipped with the smaller inverters is provided by the RV Converter, a unit that takes the 120V AC power from the power cord or AC Generator and "converts” it to 12 Volt DC to charge the batteries and operate lights and other 12 volt equipment. Newer converters are capable of fully charging the coach batteries and some provide a battery charge maintenance function. Larger inverters, found in many more modern RV’s, have an Inverter-Charger which combines a larger capacity Inverter (typically 2000 to 3500 watts) with a 3 stage charger that is capable of fully charging and maintaining the larger coach battery banks units when a source of AC is connected. In addition, these units have automatic transfer switches that transfer the AC load from the power cord or generator to the inverter in the event of a power loss without user involvement. Thus this system maintains the full function of the AC components connected to the Inverter in the event of planned (removing the power cord from the pedestal) or unplanned (incoming power problems) loss of power. Often the coach AC electrical system has a power management function and an automatic generator start (AGS) function integrated into the electrical system as well. 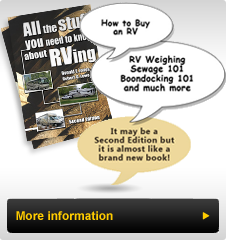 With this explanation, I’ll address the additional questions I pose when asked "Should I leave my Inverter on?” First, I ask if the RV has a combined inverter/charger. If it does, then the charger will full charge the batteries and maintain them when a source of AC power is available. This is important since the batteries, which are the inverter’s power source need to be at or close to full charge to provide reasonable power longevity when no other source of AC is available. Secondly I ask "Why do you ask” which gets to the underlying questions that the RVer has about using the inverter. Once I know what is expected, it is a lot easier to answer the primary question. With more coaches being equipped with residential refrigerators learning how to work with an inverter becomes more critical, since they are powered off and inverter when travelling down the road. Thus asking a question about whether the coach has a residential refrigerator is critical to understanding the big picture. The last question I pose is "Does your coach have an Auto Gen Start function?” If the answer is yes then generator will automatically start (provided that function is activated) to charge the batteries if they get down to the point of requiring recharging. Leaving the inverter on, provides continuity of power. If the power coming from the power cord at a campground, is interrupted, the TV will continue to function, the residential refrigerator will continue to operate (or the LP/Electric fridge will switch to LP) and life goes on pretty much uninterrupted until the batteries drop to the point where they need to be recharged. That is why it is important to have the Auto Gen Start function activated so that in the event you do not know you have lost "shore power” the batteries will only be drained to a safe level, and then be recharged. If you are leaving a campground and you turn off the breaker and disconnect, all AC equipment powered by the Inverter continues to operate. While driving the coach the batteries will be recharged by the engine driven alternator. Leaving the inverter on when using the coach provides continuity of AC power, so clocks retain their display and small appliances can be run whether you have another source of AC power or not. When the coach is stored or not being used, it is important to turn off the inverter since it is usually directly connected to the batteries and likely not controlled by the Coach Battery Disconnect switch. It will continue to draw power off the batteries unless this step is taken. To sum up, if you have an inverter/charger, and an Auto Gen Start (AGS) feature on the RV and will turn off the inverter when not using the coach, then I recommend leaving the Inverter ON when using the coach. If you have any issues with batteries, do not monitor the battery state of charge and manually start the generator when batteries get low, or are uncertain about the automatic transfer of loads from the power cord source to the Inverter, then turning it off most of the time, and on for short periods when not connected to another power source may be the best solution for you. With more coaches being equipped with residential refrigerators learning how to work with an inverter becomes more critical, since they are powered off and inverter when travelling down the road.